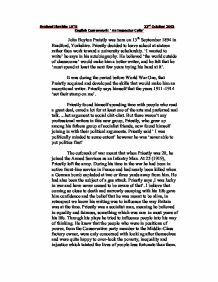 Raphael Ibrahim 10TS 23rd October 2003 English Coursework: ' An Inspector Calls' John Boyton Preistly was born on 13th September 1894 in Bradford, Yorkshire. Priestly decided to leave school at sixteen rather then work toward a university scholarship. 'I wanted to write' he says in his autobiography. He believed 'the world outside of classrooms' would make him a better writer, and he felt that he 'must spend at least the next few years trying his hand at it'. It was during the period before World War One, that Preistly acquired and developed the skills that would make him an exceptional writer. Priestly says himself that the years 1911-1914 'set their stamp on me'. Priestly found himself spending time with people who read a great deal, cared a lot for at least one of the arts and preferred real talk....hot argument to social chit-chat. But there weren't any professional writers in this new group, Priestly, who grew up among his fathers group of socialist friends, now found himself joining in with their political arguments. ...read more. themselves and were quite happy to over-look the poverty, inequality and injustice which tainted the lives of people less fortunate than them. Common themes in Priestly plays were that the audience was shown possible projections of their actions in contrast to their present conditions at the time. Another recurring theme is responsibility, individual and collective, for those actions and their subsequent reactions. He wanted people to be aware that they need to be responsible for their actions and accountable for them. Priestly wrote 'An Inspector Calls' in 1945. A particularly important year for Presitly was in 19777 when Queen Elizabeth II made him a member of the Order of Merit, which was a great honour for him. In 1984 Priestly dies at the age of 89. During the time in which an inspector calls is set there was a class system in Britain Lower class-foremen, hand-crafters, day labourers, domestic servants. Lower-Middle class- shopkeepers, small tradesmen. Diversified Middle class- moderately successful industrialists, merchants, professionals, doctors, lawyers. Upper Middle class- banking, industry, large-scale commercialists, politicians Upper Class- mostly royalty, inherited wealth. ...read more. The introduction of the welfare state in 1945 was a milestone in the treatment of lower class people. They got unemployment benefits, minimum wage, free health service and generally a better standard of living. The play opens in the dining room of a moderately large suburban house. It has solid wood furniture reflective of the style of the time. It is comfortable and of high quality but not relaxing, homelike and snug. All of the characters are in evening dress. Arthur, Eric and Gerald are in tails with white ties. Arthur is said to be a self-assured and bulky man in his 50's. Sybil Birling, his wife, is an unaffectionate, bleak and cold woman of about 50 years of age. Sheila Birling, the daughter of Sybil and Arthur Birling is an optimistic, content and elegant young woman in her early twenties. Gerald Croft is a handsome, charming well brought up man in his thirties. He is said to be a 'man-about-town' which means that he is a womaniser basically. The audience's first impressions of the Birling family would be a normal, happy and content one. However, they should know that things are not always as they seem and would expect some shocking suprises. ...read more. 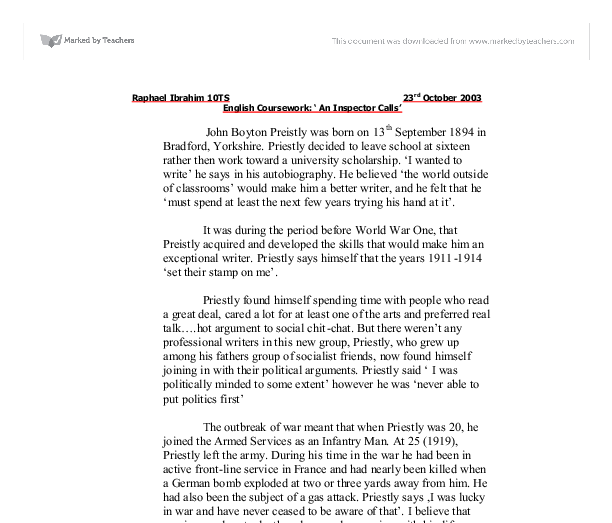 This student written piece of work is one of many that can be found in our AS and A Level JB Priestley section. The play is crafted to establish, and promote Priestly's own socialist ideas to the whole country. Priestly has structured and composed his play to convey the message that - "we are all members of one body", the way in which he uses dramatic and linguistic devices to do this is, both, ingenious and sophisticated.
" This is hopeless," he thought to himself, " I'll never get any sleep at this rate." He brought his knees up to his chin and wished for the morning to come. Then, he heard a muffled thump coming from his closet.